If you following my Instagram definitely know I'd travelled to Hong Kong. 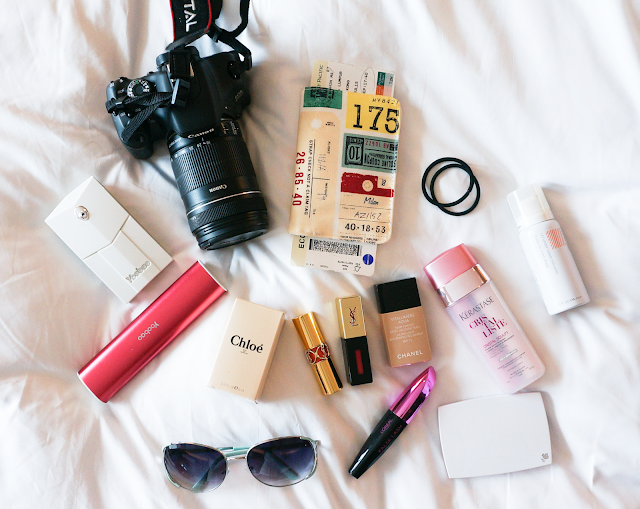 Sharing some of my basic must have for travelling. I have this phone-out-of-battery phobia. So its a must for me to bring 2 powerbank inside my bag. Using Shu Uemura POREraser UV Under Base Mousse and a minimal application of normal facial sunblock can last my make up for hot summer days. I'm a fan of YSL cosmetic recently. Their Rouge Pur Couture Vernis à Lèvres Glossy Stain is absolutely perfect and lovely. Trying out the new Rouge Volupté Shine that I bought before leaving to my trip. Gonna filter up my trip photos and blog soon!